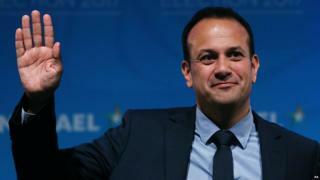 Irish Prime Minister Leo Varadkar has said people should not be afraid of "a unique solution" for Northern Ireland when it comes to Brexit. "There is a willingness to be flexible, to bend the rules for Northern Ireland," he told BBC's Spotlight. Mr Varadkar said people should not see it as a "threat to the constitutional settlement, or to the Union". He emphasised the threat to prosperity in NI and the Republic "if the wrong decisions are made" on Brexit. Mr Varadkar told BBC NI's Spotlight programme that when he spoke to people like France's President Macron and Germany's Chancellor Merkel, there was a "real understanding that Northern Ireland is unique. That this is a special place. That the peace is still fragile, and the peace is still young". "And because of that there will be enormous flexibility shown towards Northern Ireland." The taoiseach also said he would be raising the Bombardier trade dispute with Boeing at the European Council meeting this week. "It is something that I am going to talk to President Juncker about to seek the support of the European Union for Bombardier," he said. You can see a full-length interview with Leo Varadkar on BBC NI's Spotlight programme on Tuesday at 22.40 BST.